Today’s giveaway is from Sora Designs, a San Francisco based jewelry shop that I adore! Wen, the owner strives to make jewelry pieces that are functional, beautiful, wearable and super affordable. Her shop is full of sassy necklaces, adorable earrings, pretty rings and dandy bracelets. Today, Wen is offering one lucky person a chance to win this beautiful wishbone necklace. It's one of my favourite pieces from the collection and I'd wear it with my button-downs or over cozy sweaters and silk blouses. Also, did you know that the wishbone symbol brings good luck and makes your wishes come true? I am a follower and I liked Sora Designs'' Facebook page. I absolutely adore the Silver Eclipse necklace! the open star necklace is lovely! just liked her on fb. and follow you on pinterest. huzzah! I absolutely love the Bird on branch studs! My fave are the drop earrings but the whole shop is beautiful. I love the long feather necklace....i think that one will be in my girls stockings this holiday, great giveaway! I love that feather necklace and the wishbone one is beautiful! 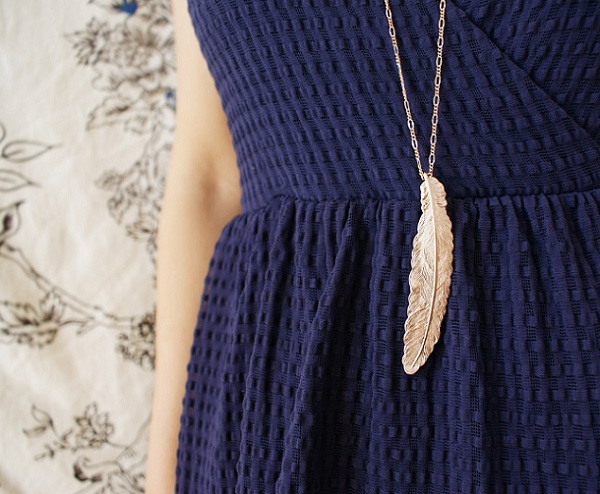 Love that rose gold feather necklace! I adore the gold leaf necklace!! So pretty. Following your blog via GFC and Bloglovin'. Following Sora Designs on Facebook as Irina Dubinskaya-Gnatiuk. Following exPress-o on Twitter as @IrinaZhoze. Following Sora Designs on Twitter. Following Sora Designs on Pinterest as Irina Dubinskaya-Gnatiuk. Joined the exPress-o group on Facebook as Irina Dubinskaya-Gnatiuk. That wishbone necklace has been on my etsy favorites list for ages! I adore it! joined the expresso FB group! It was so hard to decide which piece is my favorite! I've looked up 29 pages of these amazing pieces of art and finally decided that 'layered feather necklace' is THE ONE. I think that each piece is great, that's why I'd die to have one as a gift for my best friend. She celebrates her birthday next week and I still didn't buy her any present... I wish I could give something as beautiful to her. I love the Vintage Watchface Rabbit Necklace! I love the raindrop charm necklace! This was hard but I really love the gold stacking ring! That wishbone necklace is amazing, definitely my fave. Wow, her pieces are gorgeous!! I've favorited her store in Etsy. I'll be shopping from her for sure. So far, my favorite piece is the Peacock statement necklace (seguined/beaded). It's SOO pretty! I liked Sora Designs on FB. I follow Sora Designs on Twitter. I follow Sora Designs on Pinterest. I follow on GFC and Bloglovin! I like the Art deco bridal necklace! Lovely! Everything is beautiful....I love the Great Bear star long necklace ...I would take it definitely! Love the bird teardrop earrings!